I’ve been too busy and focused on the Oscars to see anything new in theatres from this weekend. Anyone see anything good? For a list of Oscar films on DVD, take a look at last week’s post. J. Edgar (recommended): This J. Edgar Hoover biopic comes from director Clint Eastwood, featuring a Globe- and SAG-nominated but Oscar-ignored lead performance from Leonardo DiCaprio. It’s an intriguing, worthwhile film that never quite reaches the heights that the talent involved suggests it could. 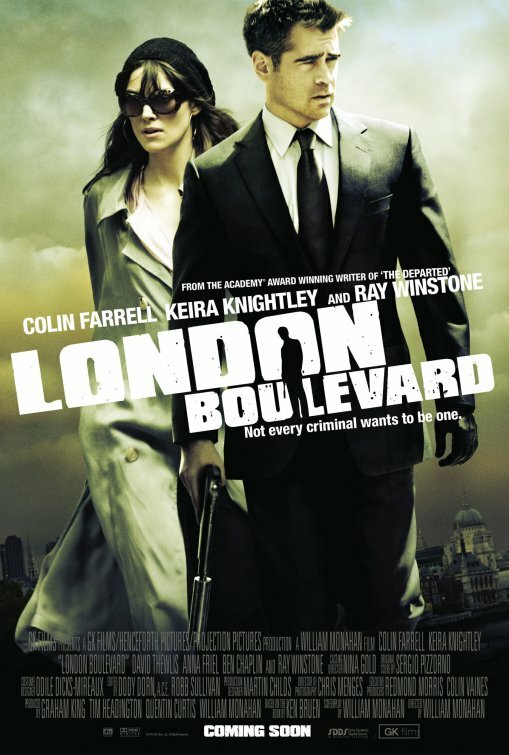 London Boulevard (recommended): This gangster drama marks the directorial debut of “The Departed” scribe William Monahan and features a superb cast working with an entertaining script full of humor. Martha Marcy May Marlene (mixed bag): This dark drama features a strong performance from Elizabeth Olsen, younger sister of the Olsen twins, as a woman escaping from a disturbing cult. The film is unsettling but also disjointed and generally unsatisfying. The Way (mixed bag): This walking road movie starring Martin Sheen and written and directed by his son Emilio Estevez is decently entertaining but otherwise relatively aimless and in no hurry to get anywhere. Oscar Best Animated Feature nominee Puss in Boots is now available on DVD as well. I haven’t yet seen it. Nothing new to report this week!